To delete points inside or on the boundary of the Remove Features, use operation type INSIDE. To delete points outside the Remove Features, use operation type OUTSIDE. 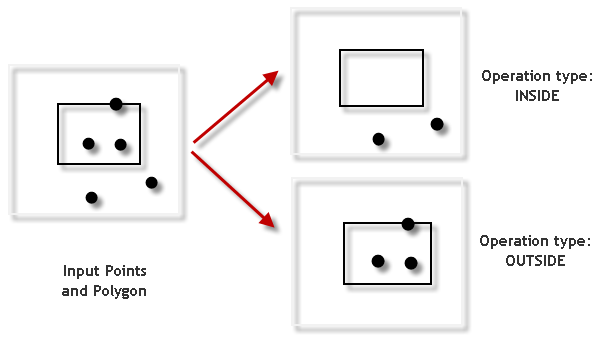 For multipoint input features, only points inside or outside the Remove Features will be deleted, depending on the Operation Type. Input features inside or outside the Remove Features will be deleted, depending on the Operation Type parameter. Determines if points inside or outside the remove features will be deleted. INSIDE —Input point features inside or on the boundary of the remove features will be deleted. OUTSIDE —Input point features outside the remove features will be deleted. The following Python window script demonstrates how to use the ErasePoint function in immediate mode. The following stand-alone script demonstrates how to use the ErasePoint function. # lake areas by high resolution lidar points.